According to radiometric dating and other sources of evidence, Earth formed about 4.54 billion years ago. Since then million of animal species came, lived, died on earth. It's call the Evolution life cycle, This timeline of evolution of life represents the current scientific theory outlining the major events during the development of life on planet Earth. In biology, evolution is any change across successive generations in the heritable characteristics of biological populations. Evolution of every are merely depends upon environmental conditions of Earth. When digging down the history of Earth we can see some animal species manage to thrive upon the different geological time span of Earth, developed before million of years ago. Here the list of that top 10 oldest animal species on Earth. Cyanobacteria is a phylum of bacteria that obtain their energy through photosynthesis. The name "cyanobacteria" comes from the color of the bacteria. They are often called blue-green algae, although some consider that name a misnomer, as cyanobacteria are prokaryotic and algae should be eukaryotic. Cyanobacterias are the oldest known living system in the world. They originated 2.8 billion years ago and the first ever microbe to produce oxygen via photosynthesis. In that way they became a part of converting Earth’s atmosphere into an oxidizing one. Cyanobacterias are also known as green-clue bacteria. The unicellular cyanobacterias reproduce through microfission. Sponges are animals of the phylum Porifera. They are multicellular organisms that have bodies full of pores and channels allowing water to circulate through them, consisting of jelly-like mesohyl sandwiched between two thin layers of cells. 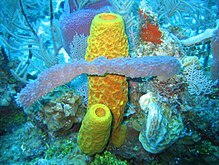 Sponges do not have nervous, digestive or circulatory systems. Instead, most rely on maintaining a constant water flow through their bodies to obtain food and oxygen and to remove wastes. There are 5000 different species of sponges in the world. They live in colonies in different depth of the oceans. They have a special power to restore the lost body part and new sponge will grow from old one. The body of sponges contains many canals, becomes shelter for many small aquatic animal species. Jellyfish are the major non-polyp form of individuals of the phylum Cnidaria. They are typified as free-swimming marine animals consisting of a gelatinous umbrella-shaped bell and trailing tentacles. Jellyfish are found in every ocean, from the surface to the deep sea. Large, often colorful, jellyfish are common in coastal zones worldwide. Jellyfish have roamed the seas for at least 500 million years, and possibly 700 million years or more, making them the oldest multi-organ animal. They have no brain and nervous system. The 90 percentage of their body contain water. They are also known for eating other jellies. Box jellyfish of the family is the most venomous species on Earth. Their tentacles have more than 5000 stinging cells. The nautilus is a pelagic marine mollusc of the cephalopod family Nautilidae, the sole extant family of the superfamily Nautilaceae and of its smaller but near equal suborder, Nautilina. Nautiluses are much closer to the first cephalopods that appeared about 500 million years ago. They have a seemingly simple brain and had long been assumed to lack intelligence. It is estimated that Nautilus is the only surviving member of the large group of shellfish. Nautilus is found in tropical water of Andaman, Fiji and Great Barrier Reef, The live under depth of 2200 feet of ocean. Nautilus also described as living fossil. These shells make them look like octopuses. The mouth of Nautilus surrounded by 100 tentacles and have a muscular hood on shells. It will help nautilus to fight against predators. The Horseshoe crabs are marine arthropods of the family Limulidae and order Xiphosura or Xiphosurida, that live primarily in and around shallow ocean waters on soft sandy or muddy bottoms. They occasionally come onto shore to mate. They are commonly used as bait and in fertilizer. 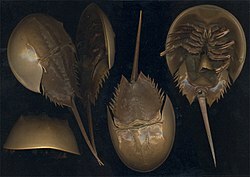 Because of their origin 450 million years ago (Mya), horseshoe crabs are considered living fossils. They have nine eyes in total, found throughout the body. Out of nine two large eyes are mainly used by horseshoe crabs and others are light receptors to control the movements. They also can sense ultra violet rays. 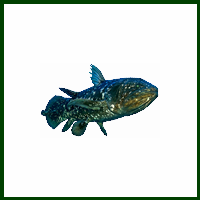 The coelacanths constitute a now rare order of fish that includes two extant species in the genus Latimeria: the West Indian Ocean coelacanth primarily found near the Comoro Islands off the east coast of Africa and the Indonesian coelacanth. Coelacanaths are one of critically endangered fish species evolved around 360 million years ago. They mainly live in in coastlines of Africa and Indonesia. Coleanaths have length of 6.5 feet and weighs upto 90 kg. Coelacanaths live in depth of 2300 feet from the surface. They have a life span of 60 years. Coelacanath move like a trotting horse. The electro sensory organ helps Coelacanath to easily detect the preys in the ocean. Coelacanaths also have power to widen their mouth to catch large preys. Sturgeon is the common name for the 27 species of fish belonging to the family Acipenseridae. Their evolution dates back to the Triassic some 245 to 208 million years ago. Sturgeons have been referred to as "primitive fishes" because their morphological characteristics have remained relatively unchanged since the earliest fossil record; Sturgeons are native to subtropical, temperate and sub-Arctic rivers, lakes and coastlines of Eurasia and North America. Sturgeons are oldest member of the bony fish family. Sturgeons have a length up to 5.5 feet and weighs between 600 kg to 200 kg. Unfortunately now sturgeons are in the list of critically endangered species. The Horseshoe Shrimp/Cephalocarida are a class in the subphylum Crustacea comprising only 12 benthic species. Though no fossil record of cephalocaridans has been found, most specialists believe them to be primitive among crustaceans. Horseshoe Shrimps were evolved on Earth in the same time as that of Dinosaurs evolve, around 200 million years ago. Horseshoe shrimp are very small in size (2 to 4 millimeters in length). The power to survive in any condition of weather and geological variations is the main quality of Horseshoe Shrimps. Once the pools of horseshoe shrimps get dries up the eggs remain dormant for many years. Scientist discovered special marine species in 1955. The frilled shark (Chlamydoselachus anguineus) is one of two extant species of shark in the family Chlamydoselachidae, with a wide but patchy distribution in the Atlantic and Pacific Oceans. This species is found over the outer continental shelf and upper continental slope, generally near the bottom, though there is evidence of substantial upward movements. It has been caught as deep as 1,570 m (5,150 ft), although it is uncommon below 1,200 m (3,900 ft). In Suruga Bay, Japan, it is most common at depths of 50–200 m (160–660 ft). Exhibiting several "primitive" features, the frilled shark has often been termed a "living fossil". The 5 foot long frilled shark has 300 trident shaped teeth over 25 rows. Frilled shark’s strange looking mouth looks much larger than that of other species of shark. Martialis heureka is a species of ant discovered in 2000 from the Amazon rainforest near Manaus, Brazil. It was described as a new species and placed as the sole member of a new subfamily, Martialinae. The generic name means "from Mars" and was given due to its unusual morphology, and the species epithet heureka indicates the surprising discovery. It belongs to the oldest known distinct lineage to have diverged from the ancestors of all other ants. It is estimated that this special kind of ant species were evolved on Earth 120 million years ago. Martialis Huereka has a pale color, 3 millimeter in length and has no eyes. They used to live in soil. The discovery of Martialis Huereka helps the biologist to make in depth study about other ant species.